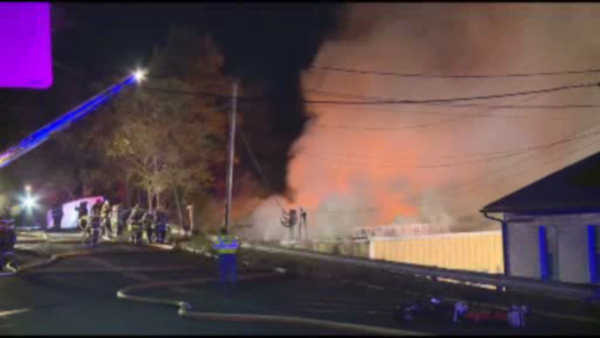 ABERDEEN TOWNSHIP, N.J. (WABC) -- Firefighters battled a large warehouse fire in New Jersey on Saturday night. The fire broke out around 9 p.m. on Lloyd Road in Aberdeen Township, Monmouth County, and was contained shortly before 11 p.m. Firefighters remained on the scene battling hotspots after the fire was under control. The fire grew to three alarms, with fire departments from neighboring towns providing mutual aid. There were no reports of any injuries. The building is owned by a company that sells hardwood flooring and lumber.